We made a day trip to Hualien, a three-hour train ride away from Taipei. It was a pleasant and refreshing change to leave cosmopolitan Taipei and immerse ourselves in the unadulterated (to a certain extent) natural wonders that Hualien had to offer. 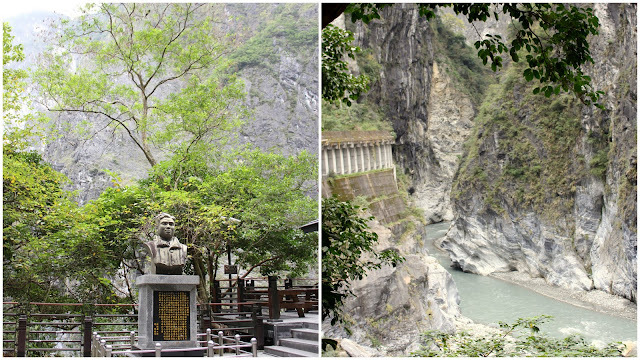 Our driver first took us to Taroko National Park which is situated in the mountainous region of Hualien . It’s so vast that it stretches over three counties, Hualien being one of them. Occasional pools of incredibly clear blue waters. Reminded me of Gosaikunda lake in Nepal, which is a 100 times the size of this! One of the things I absolutely love about travelling is the natural scenery we get sometimes. Truly breath-taking. Admiring the gorge at the Swallow Grotto (燕子口). Just look how little we are! “The rock now seen in Taroko began over 200 million years ago as sediment on the bottom of the ocean. As the sediment collected, it was subject to increasingly large amounts of pressure which eventually hardened it into limestone. Over the past 100 million years, tectonic compression between the Philippine Sea Plate and the Eurasian Plate supplied additional pressure that metamorphosed the limestone into marble. Uplifting forces from the plate collision pushed this rock above the surface of the ocean to where we see it today. In fact, the region is still being uplifted by approximately 0.5 cm per year. And if you think Taroko Gorge is the most awesome thing you’ll see in Hualien, think again. Check out the amazing view of the Pacific Ocean. Not a single boat in sight to obstruct the horizon. Imagine standing here admiring the vastness of the sea, listening to the crashing of the waves up and off the shore, and the strong winds threatening to sweep you away. It was therapeutic to say the least. After savouring a piping hot bowl of fishball soup that really calmed the nerves, we continued with lots of sashimi. We had tai, and tuna but the piece de resistance was this: salmon sashimi slices sandwiched with herring roe (I think ) cured in vinegar and sugar and plastic-wrapped with a fish (sardine perhaps?). The latter is pretty uncommon, in fact I’ve never seen it in Singapore before. The roe tasted a lot like sushi rice (because it was cured with the same ingredients) but it had a more umami-ness to it. Oh, and did I forget to mention that Hua Lien is also known as mochi-land?? 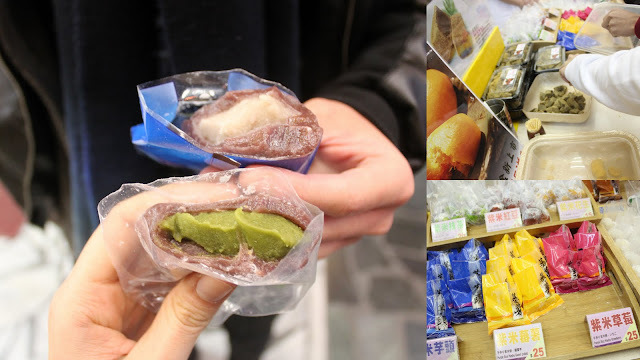 曾記麻糬 is famous for their range of hand-made mochis. The variety is astounding. I highly recommend coconut, green tea and peanut. 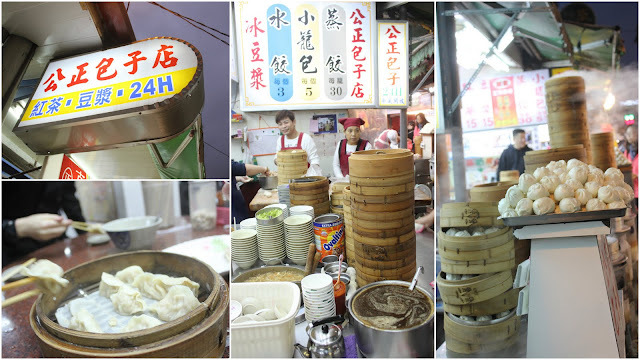 Our driver claims that this place dishes out the best xlbs, and by xlbs he means those little buns on the far right. Presentation-wise it was a little rough, but taste-wise, the pau was fluffy and soaked with the juices of the ball of pork at the centre. It’s about 25 cents sing for one anyway, so I can’t be critical can I 😉 Feel free to order everything on the menu, with the exception of maybe the spicy and sour soup. It’s a pity we only stayed for a day because Hua Lien’s such a beautiful place. A revisit next time perhaps. Hi! May I know how did you get to hualien? I am thinking of doing a one day trip to hualien too. But heard that the transportation over there is very infrequent. So would appreciate if you could share how you travel around in hualien. Thanks a lot! Hi Christina (: We went there by train frm taipei. As for transportation we got a private tour guide. Our backpacker’s hostel recommended us someone and we arranged it 2 days before we set off for hua lien (very last minute but it did work ;)). We were a group of six so our guide drove us around in a mini van. Paid about 20-30 bucks per person, and it was almost a full day affair. He brought us to a place, and let us explore it on our own. You must go hua lien! It was definitely a highlight for us. Another place I would recommend is sun moon lake. Didn’t get to go but my friends went for an overnight stay and from their pictures, the sunset and sunrise were pretty awesome. Hihi! Thanks for the reply! Do you have the cabby’s contact info? I’m going with my bf, so it’s just the two of us. Not sure if it’s worth it to hire a cabby. Sorry I lost his contact details! But yes it might not be so worth it for two but no harm asking for quotations. You might want to check with the front desk at your accommodation whether they can liaise for you? From what I gathered the taiwanese are extremely enterprising. Doing these sort of mini guided tours are extremely common in hua lien because taroko gorge for example, is quite inaccessible via public transport.